Could you be a Garden Square Gardener ? London in June, Open Garden Squares Weekend: dozens of people amble around Cleveland Square Gardens, drink in hand, while dozens more stretch on the lawn, lounge in deckchairs or find a secret seat of their own to admire this gem which for the rest of the year is accessible to residents only. Children run around and play. In one area, guests have gathered for a party - champagne corks pop, kisses are exchange, people chat, laugh, feast. Were it not for the gleaming white stucco-fronted houses who enclose the square on all four sides, you'd forget you are right in the city - the sight and atmosphere is far more reminiscent of a traditional English country house garden. Away from the crowd, a lady in T-shirt, shorts and old trainers pots up little treasures and waters a newly planted area. A volunteer perhaps. And yes, strictly speaking she is a volunteer. But Suzanne Etherton is far more than that: together with her team of gardeners she has revived the fortunes of this urban paradise, culminating in 2012 with them winning silver in the "large private square" category of the London Squares Garden Competition, and made it the flowery oasis it is today. Much of the planting is down to her design. "Four years ago, there were hardly any plants in this garden safe the trees and some shrubs", Suzanne reflects. Hard landscaping had just been put into place but little else. Residents were angry: "There was a feeling of discontent. So, at the annual meeting of the square's committee, instead of the usual five people about a hundred and five turned up." Suzanne, a resident herself, was one of them. Neighbours had privately asked her before whether she could take up the mantle as garden manager, but she'd declined. At that meeting though, she recalls, she was asked again officially - three times. Eventually Suzanne agreed but only on the condition of her being in full control of budget, staff and gardening decisions: "That was to be the only way: I'd listen to what people want but then choose and decide myself and they'd have to live with that." Wise move. An article on London's garden squares in a June 2004 issue of The Telegraph confirms just how strongly residents' opinions differ. Not just on subjects like what is permitted in the square (more of which later) but on upkeep and planting as well. "The gardeners were told to cut up asters. They would chop half the plant off - the top half..."
Nonetheless, the residents of Cleveland Square Gardens were still happy to vote Suzanne in: "People knew I could do plants. Everybody used to bring their sad-looking plants to me to nurse them back to health or tell them what to do." And that's despite Suzanne having no formal horticultural training. Anecdotal evidence suggests she likes a challenge. Reading her report on the changes to the square gardens she effected in her first year, though, one is struck by the amount of detail and explanation in it. Indication, perhaps, that she wanted to defend any action taken against accusations from others by giving precise reasons? But things could only improve. According to Suzanne, there were "awful" gardeners looking after Cleveland Square before who "didn't know a thing. She gives some hair-raising examples: "One week, under supervision from someone senior of the contracted company, they'd plant phloxes in regimented fashion. Next week - coming back without their supervisor - they would weed them all out again as they couldn't tell the difference between plants. On another occasion they were told to 'cut up' asters. They would chop half the plant off - the top half - but leave the root stock entire! Of course, that's not what they were supposed to do. But for outsiders, it looked like job done..."
"We could do so much more with London's garden squares"
In her opinion, that's the tricky bit about square gardens: committees often do not have the horticultural knowledge and hence (need to) rely on contractors. That's also why she feels it is important to share information and have a platform perhaps to exchange advice and experience amongst square garden committees or those in charge of the gardens: "We could do so much more with London's squares!" In her own early days in charge, she organised a communal bulb planting event in Cleveland Square: 13.000 sponsored bulbs had to get into the ground so she garnered help from residents to get them involved. Unplanned side effect: the boss of the firm that had tended to the gardens so far "threw a hissy fit" because of this, she says, and resigned from the contract. Rather than mourning his loss, Suzanne was actually quite glad and slowly started building up her own team. By now there are - apart from Suzanne herself who works in the garden most days - two gardeners who each come twice a week, a volunteer and occasionally another labourer. The bulb planting event, by the way, was a great success. Suzanne had painted circles, crescents etc. on the ground where she wanted the bulbs be planted ("I'm a spreadsheet girl!"). The helpers were then given flowerpots with say 10 narcissi bulbs and when those were planted they'd come back for more. Children responded most enthusiastically, but others enjoyed it too: "Even those who initially didn't want to tried and then really got into it. I remember an old gentleman who originally had said he couldn't do it because he had no green fingers. He eventually was persuaded to help and then, in spring, came up to me and very proudly pointed out a drift of flowers: 'I planted those!' "
Green fingers, then, can be acquired. Some may start later in life than others but that's no hindrance. 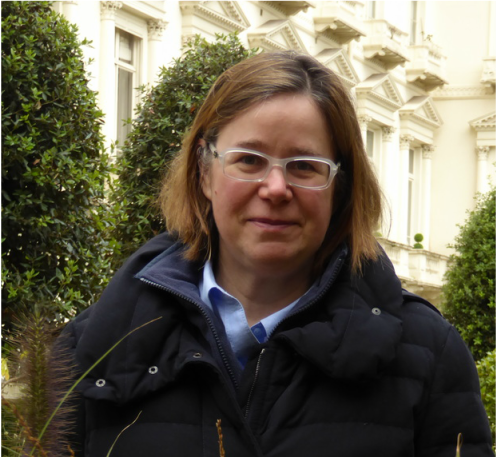 Suzanne was lucky enough to grow up with a big beautiful garden surrounding her childhood home which had a lasting influence: "My husband worked for the Foreign Office. For years our family went travelling, always moving after four years. Wherever we went, I'd create a garden - but it never crossed my mind to make a career out of it." Instead, her own professional background was in art. She had attended art college, then went and lived in Italy for a while. At that time, she says, she only painted really small pictures but by coincidence got introduced to someone who commissioned big murals for a factory building. Suzanne was asked to submit ideas, did some sketches and was finally chosen for the job. She started, never having done anything of that sort or scale before. Other commissions followed, but she fondly looks back: "I loved it. I always liked doing things people saw. It's so refreshing if they can interact - as opposed to things in galleries, the elitist type of art." Her inherent generosity shines through again when later in our meeting she casually remarks "I quite like gardening for other people." As well she may. These days, there is less communal activity when it comes to the actual gardening in Cleveland Square but there is certainly no shortage of people using it: there are about 350 residents with access to the garden. After school, on most days there are a least 50 children, mothers and nannies enjoying this semi-private sanctuary. And then there are the parties. Not commercial ones, obviously, but residents can still hire it for all sorts of occasions. While the residents' association points out that in order to keep the gardens private, quiet and available to all residents they need to restrict the number and perhaps nature of events, there still seems to be a fair amount over the course of the year. On the day we talked, for instance, they expected 500 guests to descent at night! While not responsible for organising the actual party, the garden manager would obviously have a lot on her hands. Had I known, I'd have chosen a different date but it speaks volumes about Suzanne that she still agreed and found time to chat with me. The square gardens, in Suzanne's opinion, are about people coming together, getting to know and perhaps bonding with each other: "My daughter grew up here, she made friends with other kids on the square and they have remained close. As adults, you get to know all the other residents. For the children, it's also about the freedom of being able to come here on their own when they grow older: getting the key when they are eleven years old and coming here with their friends - safe and yet left alone." Anthony Gardner, author of the above mentioned article for the Telegraph, stated: "Of all the issues that divide a square, none is more certain to raise the blood pressure than children." He quoted someone saying "As far as most people around here are concerned, gardens exist for the discreet enjoyment of mature adults. They really resent giving anything over to children and the child-owning parents are very conscious that they aren't popular." For families on the other hand, he wrote, "it was self-evident that garden squares, where children can run around freely as on the village green of yore, were designed with them in mind." Children at Cleveland Square Gardens really can count their blessings. They even allow footballs in here, I'm informed, though the official rules state "No ball games are allowed. Children under 10 may play with a soft ball provided it does not disturb others." And a few days after my visit there were to be a big party for the young ones. There would be entertainers for different age groups and everybody coming would have to contribute something for the buffet. Nothing bought though, but self-made: "It's about the sharing, about being part of a community". This all sounds very much in-keeping with Cleveland Square's reputation as being laid-back, rather than officious. Even Gardner cited it as an example when declaring that while communal life showed some people at their worst, it showed others at their best, making remarkable efforts to foster a spirit of neighbourliness. Surely though, even with such open-mindedness, there must be limits to or problems with gardening a square shared by so many? Of course there are. "The flowerbeds are a no-go/ out-of-bounds area, but children will hide in the hedges. That's okay. But we find some parents, or some cultures, see children as little gods that should be allowed everything and they believe there are too many rules here. For instance: small children love picking up the white gravel from the paths, putting it into their tiny buckets and emptying them onto the lawn. We need to tell them to bring the stones back: apart from looks, it's mainly the danger of them flying around when the lawn is mowed. The gardeners are terrified of what might happen, especially since the children follow them round as if they were the Pied Piper, It's difficult though: telling them to stop picking the gravel makes many mothers quite angry." Also, while the parents enjoy a glass of wine or a picnic in the square, their children often go wild: "There are things going on they wouldn't let the children do in a park. They'd keep an eye on them there. But because this is an enclosed, 'safe' space they think they don't need to care." That the multinational community on Cleveland Square is very well-heeled makes no difference: "They may be better educated and have better manners - but they also feel much more entitled." Other frictions are due to cultural differences: while Scandinavians (among others) consider this to be perfectly normal, elderly English people took offence when little children ran around naked under the sprinkler. So what happened? "The children won, they usually do!" But if anyone complains to Suzanne about the noise, she simply points out: "I can't do much about it, I'm afraid: It's the party season! And it's not MY garden." No it is not - not in terms of ownership, anyway. But she is the garden manager. So what were the lows from a gardener's point of view? "There was the heartbreak once when a three year old girl took off every single petal of the foxgloves and laid them out: endless trails of beautifully laid down petals - but we wanted them to set seed!" Suzanne believes it is also down to parents not educating their children about plants and how they grow. She recalls an incident where a nanny would approach one of the gardeners, asking him "Would you stop my children, please? ": they had hit off all the Allium's heads with sticks - not a single one was left to bloom. And then there was the rather unexpected disaster with the plant supports. Since children would forever run into flowerbeds to retrieve a ball, Suzanne and her team had encircled the most vulnerable plants - such as paeonies - with sturdy metal supports which were to protect them. "The children thought it a great idea: now they suddenly had real 'baskets' to kick their balls into..."
"Children are worse than starlings..."
Undeterred though, she inventively tries to find solutions. There are no more canes in the gardens to support climbers as these were always instantly nicked and used as play sticks. instead, they use netting - even fishnet stockings - around the tree trunks for clematis to climb up on. Also, Suzanne says, don't bother labelling plants - children will forever remove labels. As for seedlings: "Many children see seedling trays as toys and will kick them over. We don't have a greenhouse nor even a cold frame so we only plant seeds directly into the ground." And then the fruit: "They [the youngsters] are worse than starlings! They'll pick pretty much anything - ripe or not." She recommends greengages instead of cherries or apples as children will not notice them immediately and likely ignore rather than use them as missiles." Likewise, she had more luck with quinces: "They are so late and by that time children are back to school." In any way, herbs do better at Cleveland Square Gardens and residents are allowed to pick some. But since many didn't differentiate between ornamental salvias and sage, herbs for picking are now planted in pots. Some resident parents apparently would want to grow vegetables, too. The garden manager's opinion: "Yes, that would be great - especially to teach the children. But it would mean we'd have to put fences into the square and we'd also need a bigger budget." Apart from these mainly aesthetic and financial concerns, she also sees more practical problems: "There'd be too many people involved: they'd water the plants to death. And when the harvest needs picking in July and August, they are all away on holiday." Sometimes, however, it also works the other way round and the gardeners pick up ideas from the children. There is a woodland area in the garden, were paths, stepping stones and boulders have been laid down to keep the little darlings off the beds. They in turn love it and call it "the kingdom", pretending the boulders to be thrones. "We, too, now call it The Kingdom", Suzanne says. "Because we thought - actually, they are right: there are many jewels and treasures in there. Plant treasures." What is her own favourite area of the garden? "That varies with the seasons - usually what's about to come into flower or the most recent project: it's about the buds, anticipation and your imagination." Lucky, then, that Suzanne has just started an RHS course at the Royal Botanic Gardens in Kew: she won't run out of projects any time soon, will - along with gardening and design skills - need her imagination and won't be short of anticipation either, I'm sure.